The Office of Equity and Inclusion has announced winners of the inaugural Dr. Martin Luther King, Jr., Essay Contest and winners of the University of Oregon's 2013 Dr. Martin Luther King, Jr., Awards. In this first year of the essay contest, materials were solicited from undergraduate and graduate students in two categories: written and video essays. 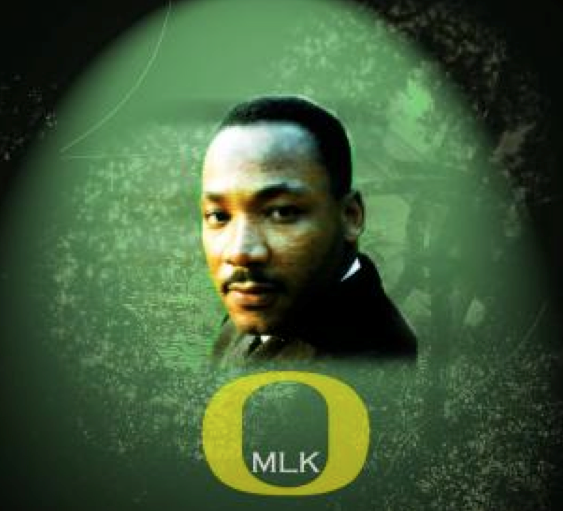 The UO's 2013 Dr. Martin Luther King, Jr., Award winners have also been selected. The awards recognize university classified staff, faculty and officers of administration whose contributions to the campus community, beyond typical job expectations, also uphold and exemplify ideals supported by Martin Luther King, Jr. This year’s Dr. Martin Luther King Jr. Awards winners were selected based on nominations from campus colleagues. UO President Michael Gottfredson will present the awards to recipients at the Dr. King Award luncheon in the EMU Ballroom on Thursday, Jan. 24, from 11:30 a.m. to 1 p.m. The award ceremony and luncheon are free and open to all members of the campus community. The Duck Store has donated prizes for the essay contest award winners.